There are several hundred digital artists in the world today who incorporate fractal elements in their art – each with his or her own style. Where algorithmic art objectively shows the geometric or mathematical structure in an aesthetically pleasing way, some fractal artists now dare to go a step further by using fractal elements to create works of art that appeal subjectively to viewers' feelings and emotions. In this paper I discuss the works of Kerry Mitchell, Robert Williams, Mark Townsend, and myself – four fractal artists with individual, well-developed, and recognizable styles. Under the relatively new umbrella of Digital Art – art made using a computer – there are several different genres and techniques, one of which is Fractal Art. Fractals are geometric representations of certain specialized mathematical formulas. The fractal's shapes, colors, and textures are all controlled by these formulas, which are, in turn, controlled by the artist's manipulation of their parameters. Fractals have the characteristic of infinitely repeating self-similarity that one sees in nature: in ferns, trees, mountains, and coastlines. Fractals have been studied by mathematicians for the last hundred years, but it was Scientific American's 1985 article  about Benoit Mandelbrot's discoveries that introduced the general public to fractal geometry. Using self-written programs or the popular freeware program, FractInt , early fractal explorers shared a fascination with the self-similarity and surprising complexity of the Mandelbrot and Julia sets. They discovered shapes that were at times familiar yet almost other-worldly and generated thousands of visually interesting images. As more diverse calculation formulas and coloring algorithms were written , placing greater creative control in the hands of the fractal explorer, some enthusiasts began to view and classify these fractal images as art. Recently developed software such as Ultra Fractal  and XenoDream  now offer users many powerful and versatile features – the capability to layer and combine fractal elements together for example – that enable skilled artists to achieve striking artistic effects . Fractals, like photographs, depict objective realities that already exist. A computer is required to perform, at the direction of the artist, the necessary calculations that transform the fractal from its native form – a mathematical formula – into shapes we can see; but it has very little to do with aesthetics. In his "Fractal Art Manifesto" Kerry Mitchell propounds that fractal art is not something that can be made by a computer alone, nor is it something that everyone with a computer can do well. Rather, the artistic value of a work of fractal art is inextricably linked with the artist's creative process – the thoughtful selection and manipulation of coloring algorithms and gradients, which give shape, color, lighting and texture to the fractal structure; compositional choices of zooming and cropping; and the merging of several layers of fractal elements together. It is this process that transforms an intriguing, but lifeless fractal shape into a finished work that reveals the artist's creative temperament. The word "unique" is terribly overused and every artist wants to think that what they do is unique. But in the world of digital art, fractals are truly unlike anything else. Some digital art is simply drawing and painting with new tools. Other techniques use software to apply darkroom processing effects to or otherwise manipulate photographs. And artists of the 3D modeling genre use sophisticated programming to replicate scenes and landscapes – both real and fantastic – but the finished works are quite similar to what painters and photographers have been creating for a long time. Fractal art is different. It can look like a bit like painting, or photography, but in no other medium can the infinite detail of fractal structures be reproduced. Fractal art has the singular ability to wed classic aesthetics with cutting edge techniques to create work that is truly unique. My own experience with fractals began in 1997. In the beginning I created works solely for my own pleasure. When I was invited to exhibit and sell my work in local (Memphis, Tennessee) galleries and art festivals, my perspective changed from enthusiastic dabbler to serious artist. In an effort to improve my own work, I endeavored to learn as much as I could about fractals and about art in general. As much information as is available on each subject notwithstanding, nowhere did I find a consensus on what, exactly, makes a fractal a work of art. Because this is uncharted territory in the world of visual art, there have been no formal standards by which to measure a fractal's artistic quality. Now that true artists are emerging in this field, I decided it would be helpful to establish qualitative guidelines with which to evaluate and judge fractal art. The first of these criteria is the set of concepts and principles of design that govern other forms of visual art. Whether learned or instinctive, fractal artists must demonstrate their understanding of and respect for the use of color, form, line, shape, space, texture, value, balance, contrast, emphasis, proportion, pattern, rhythm, unity, and variety. These elements are the visual grammar with which artists communicate, and they shape the way we look at and talk about art. Even artists of this new genre would do well to master these concepts before attempting to bend or break them. Second, the fractal artist must demonstrate a knowledge of and ability to handle the singular characteristics of fractals such as the infinite structure, which is often difficult to crop and position effectively; the use of high iterations to close up the centers of spirals or low iterations to achieve certain dramatic effects; and the challenge of working with color when, characteristic of all fractals, corresponding areas of the repeating fractal structure are colored identically. Third and most important, we must see the hand, the eye, and the heart of the fractal artist in the work. Like notes in a musical scale or a dancer's vocabulary of movement, fractals in and of themselves don't represent or mean anything until the artist breathes life into them, giving them intention and purpose. It is important that we see what the artist's soul has contributed to the work. What makes the work exceptional? What does it tell us about the artist? How does the work affect our experience of the world around us? To demonstrate these criteria, I will discuss the works of four fractal artists whose art celebrates the beauty of fractal structure in artistically diverse styles. While there are many fractal artists whose works I admire, I have chosen the works of these three artists, along with my own, because of the high standards of quality and innovation they set, and because we each have developed a clear and unique sense of style. Of the four, Kerry Mitchell's art is the most classical in structure and presentation. The late Robert Williams' style is sleek and sophisticated, with clean lines and elegant shapes. My work appeals to the viewer's senses through abundant use of texture and shading, and Mark Townsend is leaving traditional fractal structure behind and moving toward a more atmospheric style. Each of the works discussed in this paper were created with Ultra Fractal, and Mitchell and Townsend use primarily self-written formulas and algorithms. In an ironic twist Mitchell uses the chaos of fractal geometry not to represent the often frenetic pace and disorderly nature of our 21st century, but to suggest life as it could be – complex, certainly, but with order, pattern, and beauty. His works are contemplative pieces, the self-similar structure that repeats endlessly across them like a mantra, inspiring stillness and awe. "The In Crowd" (Figure 1) is an example of Mitchell's ability to accentuate the perfect beauty of fractal structure. Like the clear, pure strains of a solo flute, or the graceful movements of a ballet dancer, this classic Julia set is presented with simple elegance by black curves that sweep across a white background. The apparent simplicity of this work is deceptive for it is Mitchell's masterful manipulation of the rose curve parameters that coaxes the delicate lines into calligraphic arcs. When Mitchell uses texture in his work, it comes from the coloring of the structure rather than something added on for effect. In "Fossils 2" (Figure 2), he uses a technique whereby the parameter values and gradients in each of the multiple layers are systematically and minutely varied. Applied to a Newton structure this technique produces not only a three-dimensional, embossed effect, but adds a very subtle texture to the background areas. Mitchell's opulently-colored gradients make the fractal look as though it is molded or engraved in gold. In "A View of Hope" (Figure 3) the structure and striking use of color combine to create a dramatic statement. Mitchell's carefully designed palette moves from brilliant white through a cool blue to deep black. Each white area in this fractal is sharply edged in black, which provides both delineation to the spiral structure and the illusion of depth. Shades of blue blend seamlessly into both black and white. Structurally, arms extend from the spiral's center like the streets and highways that connect urbanites with those who live in suburbs and outlying areas. Created in response to the tragedies of September 11, 2001, this work is an eloquent reminder that we are all connected to one another by geography and our shared hopes for a peaceful future. Robert Williams' distinct artistic style used precision and simplicity to create an air of cool sophistication. His love of pure fractal structure was not unlike Mitchell's but their approach to coloring and presentation is somewhat different. In Williams' work, the shapes are sleek and streamlined with well-defined edges. He used color economically within the sharply delineated boundaries of his shapes. Like Mitchell, Williams never used texture superfluously. "Luminosity II" (Figure 4) is a good example of how Williams used flat, hard-edged coloring rather than the sculpted-with-lighting coloring Mitchell often uses. Within these delineated shapes, the coloring is subtly gradated and even though the shapes cross and colors interact, the palette is simple and controlled. As busy as the work appears, there is nothing extraneous or fussy about it. The pristine beauty of his smooth coloring and sleek lines imposes a certain distance to the work – inviting the viewer to look but not touch. The complexity of the contrapuntal shapes in this work is presented as clearly as a Bach fugue. It is the well-placed stillness in movement, the silence in music, and the empty space in visual art that often "makes" the work, and Williams demonstrated this so well in "Ship of Dreams" (Figure 5). This work is striking because of what is not there. The fractal self-similarity is quite visible in the pale yellow, lavender, and bronze figures, but only the two largest curved shapes that reach upward are required to suggest this fantasy ship. The vessel floats on an ocean we cannot see; the matte-finished sails extend heavenward, nearing, but never touching a sky we can only imagine. "La Femme" (Figure 6) is a traditional Mandelbrot image with quite untraditional coloring effects. The corseted shape is exquisitely feminine and curvaceous. Williams' use of a moiré-like texture and golden brown hues gives the dress an antique, faded taffeta look. The asymmetrical spiral design, reminiscent of a 1940s-era evening gown, glamourously accentuates one breast. The composition of the image is also intriguing because so much is left to our imagination. We don't know what the rest of the woman looks like; with only the voluptuous curves of her torso in view, we are each invited to create her face, the color of her hair, her age and height according to our pleasure. The hallmark of my style of transforming fractal elements into works of art is my penchant for texture and subtle variation in color. Initially, I added texture to my work as a way to disguise the default shiny-smoothness of some of the earliest-written coloring algorithms that seemed to give every image the same look. Now I use texture to add depth and interest, and to create a sensuous atmosphere for each work. Fractal structure is still visible in most of my work, but it is often partially obscured by texture or distorted from its original shape. In addition to using effects that cover the entire work, I apply uneven or variegated coloring, texture, and lighting to give my work an almost painted look. Areas of similar hue or texture are often dappled with shadow or diffused light to make each appear distinct. My images appeal strongly to the senses by creating evocative textures and other-worldly atmospheres into which one might want to move around and explore. Rather than confining my subjects to the boundaries of the image, I frequently allows the shapes to extend and flow off the "canvas," encouraging the viewer to imagine the unseen. Where the textures in Mitchell's work nearly always comes from slight variations in parameter values from layer to layer, I often use textures that come from completely different sources: different calculation or coloring formulas, or significant changes in the location of the fractal structure. In "Endicott" (Figure 7) the classic Mandelbrot spirals are delineated by bronze, blade-like figures that arc around each spiral's axis. The foreground appears to hover over a gray-green background of completely different design created by several layers of irregular shape, color, and texture. Subtle variations in lighting over the entire image ensure that the corresponding elements of each spiral appear slightly different, and bright red mini-Mandelbrots scattered throughout the image provide contrast. In other works I make fractals appear more chaotic through my use of texture. In "Ivgenny" (Figure 8) there is no separation between foreground shape and background texture as there is in "Endicott." The spiral's main structure is a pinched, bow-tie shape that is sculpted by the gradient to appear three-dimensional. Several textures are overlaid in spotty patches – one texture adds lacy intersecting lines near the center of each spiral and another scatters darker chunky shapes of varying sizes and orientations throughout the image. Because of this use of texture and subtle shading, we see that the corresponding areas of white, brown, and gray color do not all have the same value. In "Libellen" (Figure 9) the fractal structure is less noticeable than in other works. The dragonfly figure repeats its shape and pattern at different sizes in the top half of the image, as do the wispy figures in the bottom half, but the two sets of shapes are not aligned. Several indistinct figures hover in the background providing more ambiance than structure, and the entire image is mottled with smudgy shades of reddish-orange light and blue-green-gray shadows that evoke the sultry atmosphere of dusk. When fractal elements are used to depict real objects, the end result often looks like a carefully composed scene. In "Libellen," however, there is a sense of movement throughout the work that suggests the capture of an elusive moment in time. 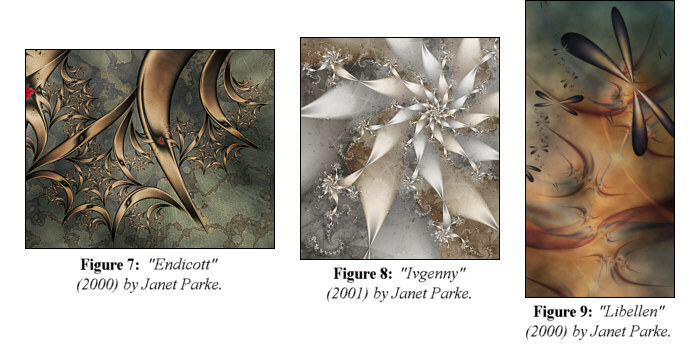 Mark Townsend's style is at the opposite end of the fractal art spectrum from Kerry Mitchell's. While he has worked extensively with classical fractal structures and coloring algorithms, his interest in formula writing and artistic taste quickly led him to explore less rigid and formal structures. Some of his earlier works contain spirals, but they're almost always presented in untraditional ways. There is something quite raw and untamed about Townsend's art. While he obviously has great knowledge of his tools and skill in using them, he constantly pushes their limits to distance his art from traditional fractal structure. The spectrum of colors in which he works is earthy and grounded. His shapes are weighty rather than ethereal and his textures often gritty. Because his remarkable style is so admired, Townsend's techniques have been widely emulated, though rarely equaled, by others. One of the works that epitomizes his early explorations away from traditional fractal structure and coloring is "Calvary" (Figure 10). Colored in dusty, de-saturated hues, this work conveys a sense of history. While not intended to be an illustration of Jesus' Crucifixion, the work quite aptly depicts The American Heritage Dictionary's second meaning of the title, "a great ordeal." There are still visible spirals, remnants of the classic Julia structure, but they are twisted into knotty contortions that blend seamlessly into the similarly gnarled background. The work is both unsettling, like the bloody destruction of a battlefield, and compelling in its sense of mystery. Shortly after creating "Calvary" Townsend's style moved toward fantasy. By writing formulas that mask certain areas of the fractal, he pioneered a style characterized by cut-out shapes set against a background – like two-dimensional set pieces in a movie. Using this masking technique he added specific texture and color to controlled areas, and the gnarly shapes with which he'd begun working seemed to take on a life of their own as preternatural shapes set against boldly-colored skies. "The Song of Time" (Figure 11) is my favorite image from this period. Its cooler palette, with gold and rust accents, is perfectly set off by a rich turquoise sky; and the familiar gnarly-type shapes are stretched and pulled like taffy into Gorgon-like fantastical creatures with glaring eyes, flaring nostrils, and a wild hair or six. In January 2001 Townsend left the world of figurative shapes and began exploring a new path. "I think I've seen enough spirals to last a lifetime," he proclaimed, and indeed there are few spirals to be found in his fractals since. Townsend began creating abstract works without a single focal point – works meant simply to be experienced like minimalist music that creates an atmosphere of sound, or free verse that lacks rhyme or predictable rhythm. "Carnal Knowledge" (Figure 12), with its all-over texture of soft, voluptuous curves and sensual shadows in creamy skin-tone hues, is a striking work from this period. Fractal art has evolved in directions and to degrees that were unimaginable just a few years ago. From Kerry Mitchell's classic approach to Mark Townsend's stretching of boundaries, we four artists are creating works that evoke feelings and emotions, speak of the human condition, and express individual perspectives of beauty and life. I believe there can be no doubt that fractal art deserves acknowledgment and respect and that the creative potential of this exciting new genre will be a changing force in visual art in the 21st century. Dewdney, A. K. "Computer Recreations." Scientific American August 1985: 16-24. Barrallo, Javier and Santiago Sanchez. "Fractals and Multi-Layer Coloring Algorithms." Bridges Conference Proceedings 2001: 89-94. Thornton, Garth and Virginia Sterling. XenoDream. Parke, Janet. "Layering Fractal Elements to Create Works of Art." Bridges Conference Proceedings 2002: 99-108. Mitchell, Kerry. Fractal Art Manifesto. 1999. Mitchell, Kerry. private communication. 2001. Williams, Robert. private communication. 2001. Townsend, Mark. private communication. 2001.